Earlier this year, I reported my impressions of the first six months with my new 718 Cayman — mostly complimentary as I struggle finding fault with any of the three Porsches I’ve owned. But if I’m entirely honest, I’ve spent the last several months making excuses for what I feel is a lack of proper tonality for a car of this caliber. 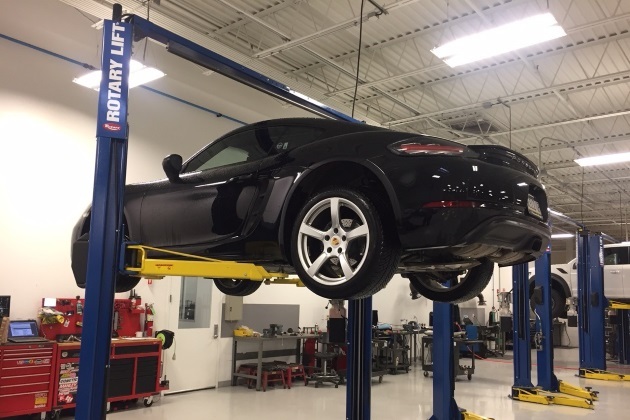 To a Porsche enthusiast, sound plays an important role in the overall experience of any vehicle, but especially in one that evokes such a raw emotion from the driver. Few of them could get away with a subpar resonance, which is why so many traditionalists shy away from the trend to smaller motors with forced induction. While I conveyed that the creation of sound is relative, there are limits to what Porsche fundamentalists find acceptable. And though the tone that emits from my 718 is not offensive, my first Cayman was equipped with that glorious flat-six, breathing freely through a performance exhaust system. So I’ve already set the bar pretty high. There are many who dislike the sound of the turbocharged flat-four, and there are others who could care less. Since I find myself defending the factory delivered exhaust note even before being asked, it stands to reason I may not be entirely happy with it. So I began searching for a more satisfying alternative. Not as easy as it sounds (pun intended). 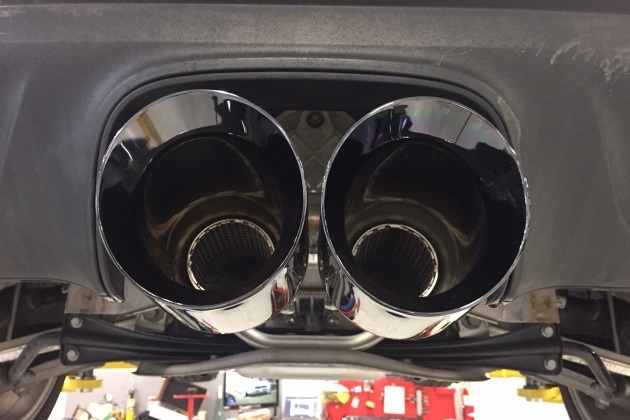 The 718 Cayman and Boxster are only about a year old, so even as involved as I am in the PCA, it’s not a simple task finding an owner who has decided to make any exhaust modification – I haven’t been able to find a single one. In fairness, there’s a level of commitment that can take years before most of us are brave enough for elective surgery. Many 718 owners opt for the Porsche Sports Exhaust (PSE), and I suspect in larger proportions than the previous generation with the flat-six motor. But this option is just too expensive to consider after the fact. And achieving that melodic note of my previous Cayman is damn near impossible considering the displacement we’re working with. I wasn’t looking for a track exhaust, because they’re generally too loud and annoying for daily driving — but I wanted something that spoke in a much lower register, like a rumbling distant thunderstorm. There are thankfully many options out there that range from simple to downright complicated. With much research, I finally landed on a solution that seemed the most promising, and the company was coincidentally in my backyard. AWE-Tuning has been in existence in the suburbs of Philadelphia since 1991. Their newly completed facility houses design, engineering, manufacturing and fabrication teams under one roof — and right here in the USA. 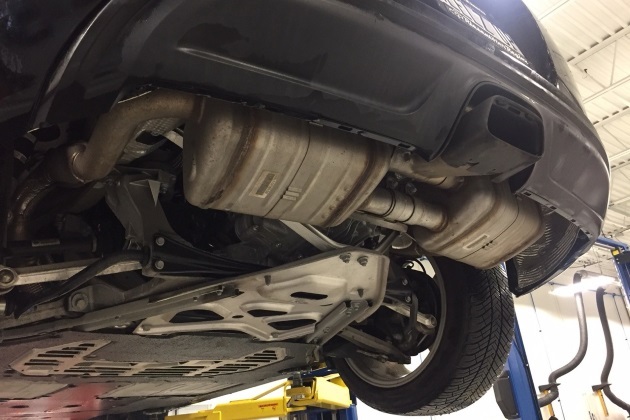 I found there are several factors affecting the noise created by any first-class exhaust systems. Ultimately I chose their Touring Edition with smoother flowing tubing and bullet-style mufflers that mix stainless and composite acoustical packing to generate a throaty growl. The day finally arrived. I was there an hour before they opened the doors, but was soon invited into the waiting area, complete with two pristine pieces of hardware — a vintage 911 Turbo and a later model Audi R8 convertible. Not bad company to share space with for a few hours as the process wouldn’t take more than the morning to complete. Once on the lift the underbelly was exposed and I could more readily envision the transformation. Porsche engineering borders on artwork, even beneath the vehicle where many would never look. But there was an abundance of bulk under there — predominantly a pair of mufflers each the size of a mailbox. In short order this would all be gone. I returned to the waiting area now with high hopes. There was a huge glass pane separating me from the action, but I could hear the muted activity throughout the procedure. I got up no less than thirty times to pretend to stretch my legs, but I might as well have pressed my face up to the glass like a kid peering into a bakery. The next hour felt like an eternity, but at precisely noon — not three hours after I handed over the keys, the technician tapped me on the shoulder. My car was now complete, and he would need to take it out for a final road test. The technician idled past me and then out onto the side street. He squeezed down on the throttle and ripped through a few gears and I heard him disappear quickly into the distance. It sounded so awesome, and my eyes welled up in appreciation. Like music, exhaust note is the very soul of the machine, the driver and the moment. The amended baritone is extraordinarily beautiful and absent of excessive drone. Not harsh but commanding. Not obnoxious but persuasive — better than I could have ever imagined, perhaps even more so than my beloved flat-six if that’s even possible. Hard acceleration/deceleration, especially when selecting the sport option on my PDK, encourages pops and other pleasant noises for a truly entertaining experience — though I could easily sneak out of my neighborhood without attracting too much attention when driving more conservatively. I’m not sure I can speak directly to performance gains — AWE claims are modest with this singular modification. It does feel more responsive, but that’s quite possibly in my head and connected to the intrinsic transformation. It simply feels more aggressive, and on a twisty country road in sport mode, the 718 is utterly vicious. I’ve test-driven the Porsche Sport Exhaust in the Cayman several times and I’m now glad I didn’t head in that direction as was my original intention. I’d be leaving the PSE mode on nearly all the time, and although it does alter the noise quite considerably, that satisfying rumble is simply not there. So now every time I lower myself into the buckets of my 718 and chirp the motor to life, I sit for a moment and bathe in the harmonious composition. The music that used to play through an adequate sound system now sings sweetly throughout the cabin — sourced from just behind my right ear. A performance exhaust system isn’t for everyone, and it took me months to come to this predictable conclusion. But with a singular alteration, what was once my extraordinarily delightful car is now nothing short of perfection. David Newton is an active board member of the Riesentöter region of the Porsche Club of America (PCA) and a regular contributor and columnist to their newsletter Der Gasser. He doesn't race and is not a mechanic or an engineer, but he draws from his unique perspective as an enthusiast who loves everything and anything connected with exceptional cars.